Chinese troops receive AMSAC supplies by air from An American Douglas C-47 Dakota of the Tenth Air Force. This day transports flew nearly 300 sorties to several locations in the China-Burma-India Theatre. 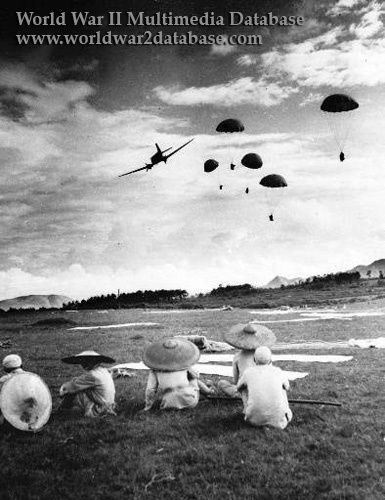 Far more tonnage was landed at forward strips than was parachuted or free-dropped to the combat troops in north Burma. Services of Supply estimated it cost nearly $2,000 a ton to parachute supplies, $100 a ton to free-drop, and $50 to land by plane. The big cost was the parachute, returned in less than 10 out of every 1,000 cases. Soldiers in the jungle had too many uses for them. They made good tents, were excellent cover on a cold night, and were fine for trading with the Burmese civilians. When supplies of British-designed rigging ran low, Indian workers made the first packaging and parachutes locally. The highly successful "country basket," was made out woven bamboo, covered with hessian cloth, and set in folds of heavy rope fastened to the parachute. It was so strong and shock-resistant that it needed no rice chaff or sawdust around it. Even eggs survived in it. The "country basket" could carry 200 pounds in actual operations. However, where old-style baskets cost $54 apiece, it was replaced by a new container costing $3.50 each. Called AMSAC ("American Sack") it occupies only one-seventh of the storage space taken up by the old-type baskets. When filled, AMSAC is a burlap-covered bale 21 inches square at the ends and 36 inches deep. The new container was developed by Lt. Riley G. Jones, officer-in-charge of the Quartermaster Specifications Branch. AMSAC was also made in India by Indian labor, and utilized Indian products exclusively, reducing costs. Loads up to 465 pounds were dropped from planes in planes flying 130 miles an hour at an altitude of 150 feet. 360 pounds will constitute the average maximum load. The additional capacity was a factor for emergency airdrops. C-47 Dakotas were preferred for airdrops because the Curtiss C-46 Commando would lose attitude control when the cargo left the aircraft. Crew of C-47 "Early Delivery"